The Khiro Angled Wedge Rail Riser Kit contains 8 different degrees of angle (2 EACH) to customize your deck any way you want. Stack them or run them stock -- anything is now possible! These unique rail risers are made of Khiro's special hard polypropylene formula offering excellent durability without adding alot of extra weight. Risers feature old and new school hole patterns for maximum versatility for any application. About Khiro: Khiro Products are engineered and manufactured in Southern California of the highest quality materials. 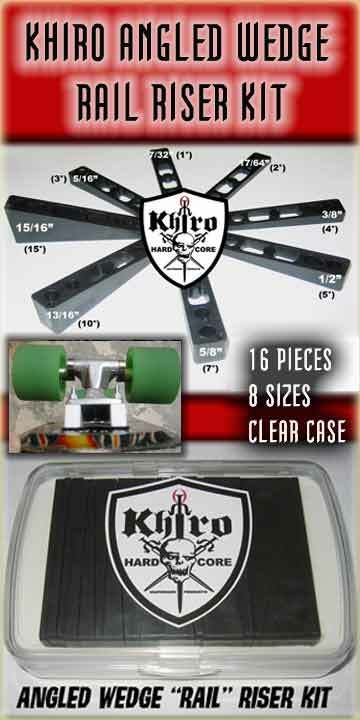 The Khiro line includes bushings, wedges, risers, shock pads and more - designed to fine-tune your skateboard for better response, performance and durability.